Ideally we wanted a GC for its styling and lighter weight. We did come across several, but ones that were driveable were way out of our price range, and ones that weren't had every conceivable issue except a blown motor. One day I came across a bug-eye Impreza Outback that caught my eye. It was a couple hours' drive from home, but the price was way below market. I called the owner expecting to hear about its slipping clutch, worn out synchros, leaking head gaskets, holes in the floor... yet there was none of that. The seller went on and on about the tiniest of scratches and quirks, but as far as I could tell the car was as meticulously maintained as it could have been. Not a single issue in the drivetrain, chassis, suspension.. didn't even have any visible rust. Without further hesitation, I scheduled a viewing for the next evening excited about the fact that we may have finally found our car. The next day, I got up early, printed out the directions, filled up the car and drove to work. 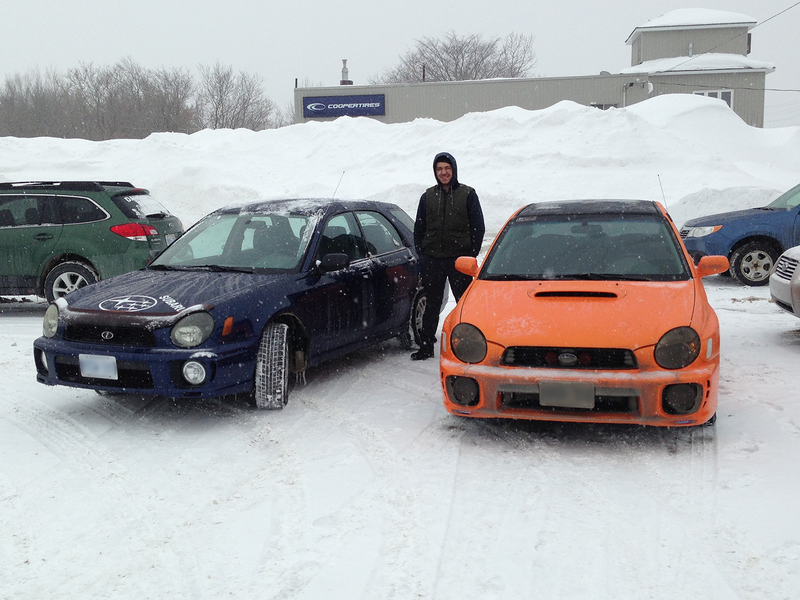 The plan was - I'd pick up my friend after work, and we'd make the 3 hour drive to see the Impreza. If it would be as good as it sounded on the phone, we'd buy it on the spot and figure out the rest later. During my lunch break, as I was driving out to the bank to withdraw cash for the car, I got a phone call. 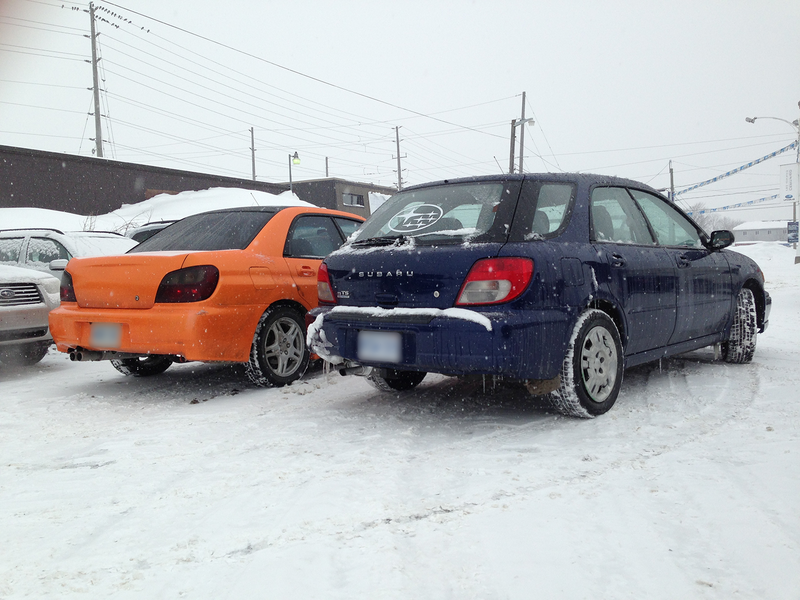 It was the seller of the Impreza. "Sorry, the car is sold." Damn! Another few weeks went by, and as luck would have it another car popped up. Another bug-eye wagon, with just under 400,000 kilometres on the odometer but at a steal of a price. We weren't gonna let this one go! We called the owner, who sounded like the shadiest guy I've ever had to deal with, and agreed to meet the following morning. The next day, we woke up at dawn and made our way up highway 400 to Orillia to see the car. There she was. An 02 Impreza wagon in World Rally Blue (just of a darker variety). Covered in a layer of rust proofing so thick it was hard to tell what was underneath. It looked disgusting, but it seemed to work as the car had very little rust on the body. No service history except a recent oil change and the fact that the A/C was taken out when the compressor seized (not a problem - because racecar!). The car didn't have plates so we couldn't drive it on the street. We made a circle around the parking lot, kicked the tire, looked at each other, shrugged our shoulders and said "we'll take it!". That day I set several personal records - cheapest car I ever bought, shadiest person I've ever bought from, highest mileage car I've ever bought (and owned)... just to name a few. Didn't matter. We were as excited as if it were Colin McRae's 22B. Here she is the day we picked her up, next to my friend's WRX.